An Arima hallmark, great at floating an engine and making the boats uber stable! However, I think Mr Arima's stern design was for a single small (efficient, affordable) engine. While a work of art, the "no 90 degree-anywhere-Arima" complaint (as my davit manufacturer calls it) sure does complicate a kicker mount. So, were kickers just not thought "necessity" when our boats were designed? I am joyfully (nervously) running on a new E-tec 90 with no kicker...trolls so nice in the Columbia! My New England friends think a "kicker" is the brown neoprene boots we all have a worn out pair of! The massive build up of engine hours. And on an Etec that means more trips to the shop because their schedule is figured on total engine hours. Quality manufacturers of fixed kicker brackets such as Arima angle the extension so that it goes straight back rather than out at the angle of the sponson. They produce a quality bracket that is competitively priced. All of the Arima's I've seen had kicker brackets on them, or the provisions for brackets made at the factory. Originally, they shipped with OMC hydraulic brackets or Gaerlick spring-loaded. Both adjust on the kicker-side of things to correct for the angle. More recent boats have had the fixed bracket option. A top of the line kicker is $3000, and costs maybe $50 to do a full service of, and burn maybe .5 of a gallon per hour trolling. A decent 90 hp motor is going to cost near $10,000 these days, and cost two or three times that. I know which one I'd rather rack up the hours on! Yea, I hear you. I can understand the need for a kicker motor where trolling for hours chasing a particular species of fish is necessary........(obviously the case in the Northwest). That said, not a lot people troll for fish around here. In New England, your either out jigging the bottom, or sitting in (or at the mouth of) a river waiting for striped bass to show-up. Consequently, most people would be buying a kicker simply for the sake of insurance against an already very dependable modern outboard. A waste of money, IMO. Well I drifted about for years fishing halibut in the Inside Passage. What little trolling I did was for salmon but was often interrupted by halibut, sometimes the take was really severe until they let go of the flasher. Anchoring up and throwing spoons is fun, and can out produce trolling. Seems like anchoring to fish the Columbia is the law or something. Not really using the main to troll much, just when the need to move across or away, we just drop the troll gear and idle around a bit. I may carry the kicker forward just in case in salt water. Nice to not have another item to steer fish around in the stern area. Maybe some day I will rejoin the kicker crowd. In Cabo, our Mexican Guide had just put a new Yamaha 150 on his Panga. He sold his old Honda 130 to another guide and we saw that guide running around near us. Oil changed every 100 hours, waterpump as needed. Around here some will say the world ends if you don’t flush after every trip and would never keep/buy an outboard with 1,000 hours. Makes me very comfortable with my 2002 Yamaha F100 with 700 hours and I don’t worry about a few extra trolling hours. Then a kicker is not for you....most of us either troll with a kicker or have one as a safety backup as I do. I don't think you will be able to talk anyone out of their kicker motor no matter what their use is. How many hours must these motors have on them? I’m still debating on whether I want a kicker or not. About 75-80% of the time I’m trolling for either salmon, halibut, or stripers. The other times I’m either drift fishing, or anchored up for sturgeon. I don’t want to rack up all those hours on the main, but I don’t want to have to hold a tiller handle all day and have another motor to flush and maintain either. :shrug9: I guess for me it’s the cost of a kicker mostly, is it really worth another 3-4K ? I've often thought the same thing about getting a kicker... there are obvious pros and cons for each side of the equation. The pros for getting a kicker would be that if your motor craps out for whatever reason that you'd have a backup. It would also take hours off the main motor and probably get you better fuel economy than the main? The cons that I can think of would obviously be the price. A new 6-9.9hp kicker motor I'm guessing would be $2500 and up, less for a used one obviously. But you can buy a lot of gas for a couple grand. Also another negative would be that you're adding more weight to an already low arse end of the boat. I have heard the same things about these 4 stroke main motors though... that you can put 4k+ hours on them with relatively low maintenance and they still perform like a champ, if you take somewhat decent care of them that is. A friend of a friend has a Honda 4 stroke for his main and it's got over 5k hours on the motor and still running just fine. I wonder if the cold winters up here in the northwest where it gets to freezing temperatures have some kind of impact on longevity? The friend of the friend that I have lives in Oregon and it's similar in weather conditions to Washington but Mexico I don't think ever gets very cold, especially during the winter. I flush my motor with Salt Away just for peace of mind and then use some Stabil for the fuel since it will likely sit for 6 months or more. Some have advised to do way more than that and some say you probably don't even need to do that. Seems a lot like personal preference and what has worked well in the past for some. The motors in Mexico are not flushed but are run daily, that probably makes a big difference. We park ours for weeks or months at a time and in that case it's better to flush. In all my years on Puget Sound, I've only had to get home with the kicker one time but that was enough. New Yamaha main blew a rotor stator at Eglon across Puget Sound and I had launched 6 miles away at Edmonds. It is worth the cost and weight to have a back up although it did take a bit over an hour to get back to our home dock. As a bonus, the kicker will troll all day on a gallon and keep hours off the main. It would be pretty easy to end up on the beach or on some rocks if all you have is a paddle while you wait for help to show up. Along with all the reasons listed above, speed is another factor. The slowest I can get my main is 3.5 or 4 mph. That's too fast for Chinook IMO and I would have a hard time trolling if I didn't have a kicker. The benefits of running a kicker FAR outweigh the negatives. When I had my old 2 stroke 120 hp it would not troll slow enough for salmon, now that I have a 4 stroke I can slow down to 1.5 mph. But the kicker is not going any were and I almost never use it. If the main packs it in for any reason I'm still coming in, if I ran twin mains there would be no kicker. My kicker is only there for safety now. Sitting kills 4 stroke motors, not too many hours. Most Mexican guide pangas get run every single day. Their ports don't face big swells on bar crossings, and the panga's I've fished in down there stick close to shore. I've seen mid-80's 2 stroke Yamaha's down there still going strong... most of those motors sold in the PNW died long ago with less than 500 hours on them. Folks who fish more protected waters in the PNW are probably fine with no kicker, especially if they have Sea Tow or some similar service in the area. IMO, it is not very healthy to fish the ocean, or big coastal bays/estuaries, without a kicker (or twin engines). Doesn't matter how well your motor is running... hit a crab pot rope on the CR or Tillamook bars when they are rough and you are going to have very bad day. Heck, even a sunfish or blue shark suddenly popping up in front of your boat on the ocean can result in a spun prop hub. With kicker you might have a slow ride in, but it's better than trying to paddle your boat back across the bar. Even on a strong ebb current, a kicker at least lets you keep the boat pointed in the right direction, and vastly reduces the risk of a capsize. To each his own, I guess. To me, a kicker is a basic piece of safety equipment, and a way to reduce wear and tear on my $25k main motor. Very early in our Arima ownership when the First Sargent was piloting, she hit a three foot piece of two inch diameter floating rope. right there in the scum line with other assorted green floating stuff. We rather suddenly slowed down. Prop not spun, blades all flattened and similarly curled on the ends. Cleared the rope. I thought it would be a good idea to use the kicker back to the harbor, maybe three NMs away. It worked, I could have anchored and changed out the prop, that would have been faster! Other than trolling a bit in no wind situations that was about my total use in seven years. About 450 hours on the old 2 stroke main and about half as much on the six horse. Both engines were 1997 Yamahas as new on Darci when we bought her. Anybody need a Michigan Wheel 17 pitch for a Yamaha? And a new in the box for a 6 HP? My wife was upset, I told her it was just like getting a flat tire! The prop guy fixed it and gave it back about two years later. I do carry spare parts. I always use my kicker for trolling. Cheap to run and easy to use with an EZ steer and iTroll kicker throttle control for precise speed control. The iTroll is one of the best things I have bought. On my boat the kicker gets far more hours than the main each year. That would be me....nailing salmon. I have let myself get comfortable out of habit just using the main, but in the future I plan to use the kicker. I have a lock on my kicker and will steer with the main. 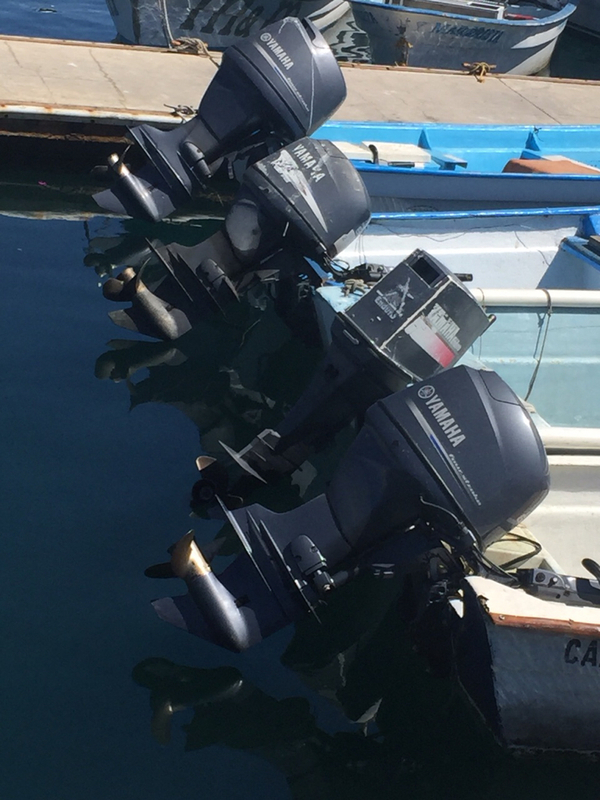 If you do use your main for trolling and want to go slower you could switch to a lower pitch prop during salmon season then switch back to your normal prop. Good time to grease the prop shaft as well. Of course your top end speed will suffer but you’ll get good hole shot and on plane faster with a heavy load. Just an option.